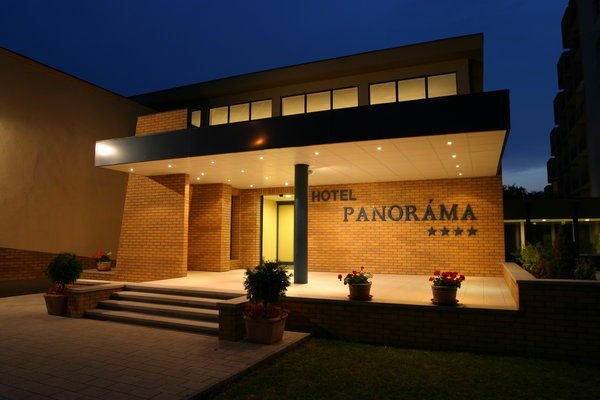 The four-star Hotel Panoráma****, which is situated on the Golden Beach in Siófok, some minutes far from the town centre, is opened all the year and has 148 rooms and 8 appartments. The calm atmosphere provides perfect leisure facilities those who want to relax and also those who prefer active holiday. All the rooms are equipped with air condition, SAT-TV, phone, minibar, hairdryer, Internet connection, most of them has balcony. In the twin rooms it is possible to take in an extra bed for children under 12 years. 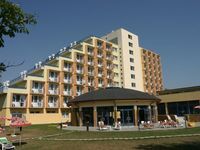 The appartments and the connecting rooms provide a comfortable solution for families with children. The restaurant offers a large choice of Hungarian and international cuisines on its rich buffet table. The coffee-bar and the terrace awaits the guests with refreshening soft drinks and cocktail specialities. From here we can directly enter the splendid interior garden of the hotel, which is so suitable for organizing outdoor events and grill-partys. to rent a bike in the hotel. For those, who would like to be not only healthier but a bit younger too, we can offer the treatments of our beauty salon, our hairdresser's, the manicure and pedicure studio, the massage corner and the solarium. Our further services can make your holiday more comfortable: closed parking lots, safe, Wi-Fi connection in the hall and in the conference and meeting rooms, play room, playground in the garden and children's corner in the house. The hotel satisfies all the demands of conferences, seminars, trainings, meetings and other events too. The natural lighted conference rooms are equipped with all the required techniques. There are two conference halls for 400 and 100 persons, four other meeting rooms for 40 persons and two smaller rooms for 6-6 persons, which can be a possible scene of an event. • The hotel's own parking lot is available for the guests at 1000 HUF per car per day.